Glamping – glamorous or luxury camping – is a trend growing world-wide. Feeling the need to unwind and escape from the pressures of work and city living? You are not alone. Thousands world-wide are actively seeking truly unique accommodation. The need to reconnect with the outdoors without giving up all the creature comforts is an attractive concept. Glamping offerings vary enormously – Yurts, Bell tents, cabooses, cabins, caravans …..
What they all have in common is a closer connection with the outdoors but with a bit of luxury – comfy beds, heating, music, beautiful natural surrounds, wild-life……. 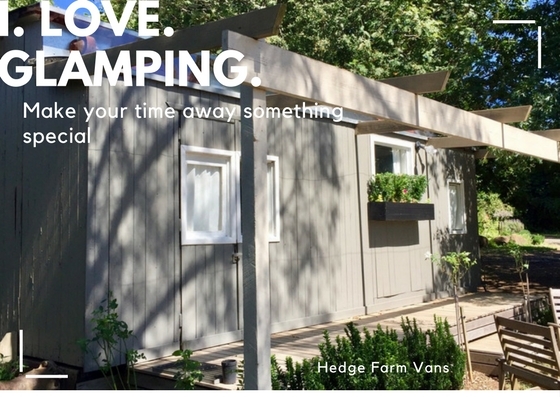 Here at Hedge Farm our two little railway vans (both originally built for railway workers in Victoria) are our own contribution to the need for glamping. These quirky little cabooses were moved to our property long before our purchase of the land in 2009. Sadly by that time they were badly neglected. So we were faced with the decision – do we remove them from the property or give them a new lease of life? We chose the latter. So we got out our tools and paint brushes and started the task of bringing them back to life. We fell in love with them the moment we started renovations. The craftsmanship employed in making them is not often seen in buildings today. The quirky features – pot-belly stove, raised brake van seats with steering wheel, baggage shelves and workers desk, all create a special experience for guests. Although small in size they offer cozy comforts as well as the opportunity to wander the farm or to sit outside on the purpose built desks to take in the bird-life and garden surrounds. Rug up when its cool and bask in the sun when its warmer.